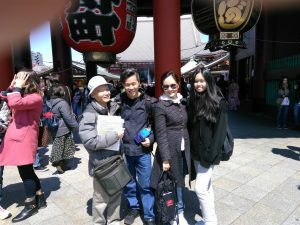 I guided a Vietnamese-Australian family of three to Asakusa. 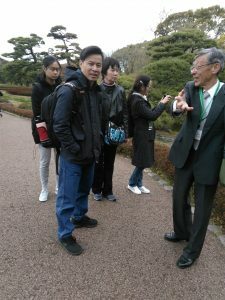 They seemed to be astonished by the large number of tourists. We passed through many shops and went to the Sensoji Temple. And then we prayed for good health and safety on our tour at the Sensoji Temple. The cherry blossoms of the Imperial Palace East Garden are in full bloom. Aside from cherry blossoms, there are so many flowers and trees to view there. We enjoyed the quiet time in the busy city. I think they could find a lot of differences between Australia and Japan because the seasons are totally opposite.